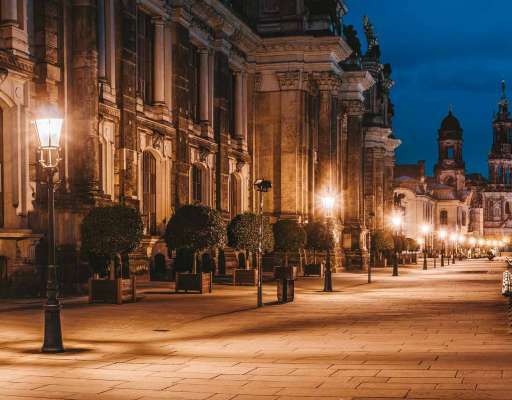 Last weekend I was spontaneously in Dresden and had a few hours to sip through the city. I had the new Coffee Guide of the Crema Magazine with me and was surprised that some cafes and roasters have neither Saturday nor Sunday open. So it was easy to decide where to go. First I went to Tanteleuk in the trendy district – äußere Neustadt. I absolutely needed a late breakfast and went for the bagels. But They have also a biiiig selection of amazing pies. It took me a while to decide on a coffee, because there are 14 different types of coffee: from the classics espresso, milk coffee, cappuccino and co., all made with Sagafredo beans, to hand-brewed chemex coffee from Coffee Circle. That’s my choice, as I don’t have a Chemex at home. Now I just had to choose one of the 5 Coffee Circle coffees – I take Kivu from the Congo. In addition a bagel and a gooseberry limo. The decor in Tanteleuk is cozy. There are animal motif tiles on the wall, the benches come directly from a gymnasium, chairs and tables are made of wood and the lighting is pleasantly warm. I’m allowed to watch how my coffee is brewed and the food and drinks come on a mix of beautiful old porcelain. The coffee tastes great, the staff is super-loving and hospitable. I am not surprised the cafe is packed. Be sure to stop by! The weather is not very cozy. Luckily, the next coffee roaster is just around the corner. When I get in, a group of men is leaving the store and I have roaster Frederick all to myself. I am already looking forward to a conversation, because the Phoenix Coffee Roasters have been around since 2006 and are thus among the German pioneers of the Third Wave who toast specialty coffee. You can choose from 6 coffees from Panama, Costa Rica, Brazil and El Salvador. Half of the coffee is available as filter roast – the other as espresso roast. One each is light, medium and dark roasted. Frederick tells me right away that the medium roast is quite light. Although I like it stronger, I try it and order an espresso with the medium roasted coffee from Costa Rica. Tasty but still too acidic for me as an espresso. So the dark roasted Brazilian from the La Marzocco coffee machine comes next. With his dark chocolate notes it is certainly suitable for cappuccino, flat-white and co. At this cool little roastery, you can not only buy beans, but talk about coffee as well. I won’t finish as I want to check out the partner café Oswaldz, which buy their coffee from the Phoenix Coffee Roasters. This evening there will also be a vernissage. Day 2. I omitted the Dallmayr coffee from the machine at breakfast in the hotel. Fortunately, after a short sightseeing walk, around the corner of the Frauenkirche, I get my first coffee of the day at Dresden’s Kaffeestübchen. Yesterday everything was very hip, there its getting classic – just with good coffee. I order a Dresdener Gedeck and get a big piece of damn delicious cake, called Eierschecke, a cup of coffee crème and a glass of Dresden coffee liqueur after old family recipe. The in-house coffee blend is roasted by Kaffanero and tastes nicely strong and full-bodied. I would like to have a visit to the roastery as well but they are closed on Sundays. The Dresdner Kaffeestübchen – is in fact only a small room for only a few guests. Accordingly, one can talk with the barista directly from the table and admire the smorgasbord on the walls or even write on a wall. The last one is mine, very strong and keeps me as awake the rest of the day. With the dessert a super delicious combination. You have to try this place. The food is fresh and delicious, the staff is lovely and if you want to experiment culturally with coffee, is just perfect. In Dresden you get a great choice of different coffee of great quality. When I come back the next time hopefully during the week, to test other coffee shops and cafes that are closed on Sundays or the weekend.